Dungeon Crawl is heading to Werribee Zoo for a one-off dinosaur-themed show as part of Zoorassic! Join Richard, Ben and guests Brianna Williams, Adam McKenzie and Louisa Fitzhardinge on May 19 as part of the Dino Files series of comedy events for adults. Info and tickets here! Enter the dungeon. Kill the monsters. Take their stuff. Dungeon Crawl Time artwork by Tank Monsternova. 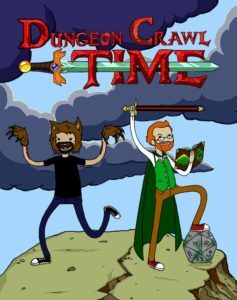 Dungeon Crawl grew out of Ben and Richard’s original D&D comedy show +1 Sword, becoming a cult hit at festivals and running regularly at Melbourne’s beloved Bella Union bar from 2011 to 2014. While mostly embracing the tropes and foibles of traditional fantasy adventure, it’s also run with themes as diverse as Lovecraftian cosmic horror, superheroes, Star Wars, videogames, the Whedonverse, Harry Potter and The Golden Girls (yes, really). Over the years guests have included Brianna Williams (The Big Hoo-Haa, The Bachelor Unpacked), Lawrence Leung (Choose Your Own Adventure, Offspring), Jordan Raskopoulos (The Axis of Awesome, Insert Coin), Scott Edgar (Tripod), Celia Pacquola (Utopia, Rosehaven), Danny McGinlay (Bannerman), Stephanie “Hex” Bendixsen (Good Game, ScreenPlay) and a long list of Melbourne’s top comedians, improvisers and actors. With Bri Williams (The Bachelor Unpacked), Tegan Higginbotham (Whovians) and Jordan Raskopoulos (The Axis of Awesome), plus special guests Adam McKenzie (Watson) and Burnie Burns (Rooster Teeth). With Louisa Fitzhardinge (The Big Hoo-HAA! ), Edan Lacey (Dragon Friends) and Bri Williams, plus special guests John Robertson (The Dark Room), Tegan Higginbotham, Adam McKenzie, Paul F Verhoeven (28 Plays Later) and Jess Hutchinson, and live music from comedy duo PickUp!